The teachers in the High School Journalism Institute are creating their blogs. I think only one of the class previously has had a blog. So we’re blazing a new media frontier. I have two books that I think are excellent for helping one get into the mindset of the professional blogger. Guerrilla Marketing was recommended to me by former student Natalie Mitchell, who had had owned a public relations firm. Natalie knew I liked to use up-to-date media examples in class and wanted me to be aware of some of the trends in public relations, marketing and advertising that work around traditional media. Instead of paying for a newspaper ad, Guerrilla Marketing describes how to use strategies — especially blogs — to directly reach customers and clients and potential customers and clients. Reading the book helps develop that mindset of how blogs can be used to promote a business or product. 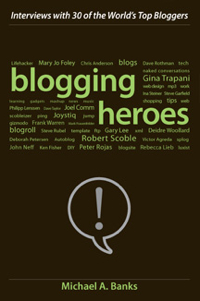 I read Blogging Heroes as a way of learning more about why bloggers blog. The book contains a Q&A with 30 different bloggers.